In regards to Disney, my favorite characters have always been the villains. These antagonists have so much more depth, possessing complex and intriguing backstories. ShirtPunch! knows what's up, making Medusa The Dollmaker's "Mistress Of Evil" one of today's (06.11.14) pop culture offerings. The portrayal of Maleficent is stunning, definitely giving Angelina Jolie a run for her money in terms of beauty. Ladies, remember you can always get a flattering fitted tee (as opposed to the standard unisex style) for the same low price of $10. 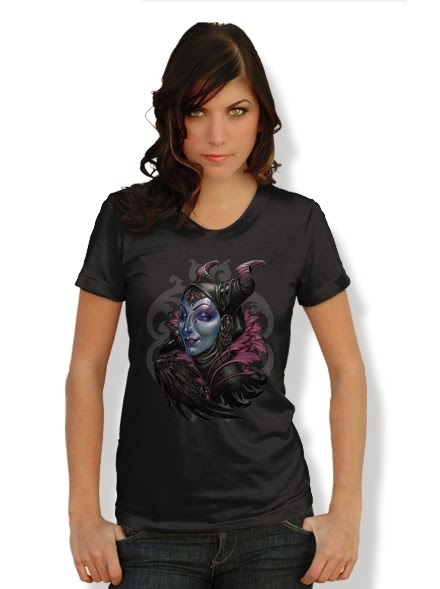 And don't forget there are also kids sizes for your mini-Maleficent. UPDATE 06.16.14 This can still be purchased through Medusa The Dollmaker's Design By Human's shop.